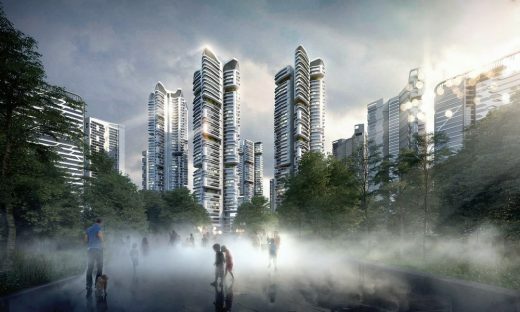 16th Nov 2016 – UNStudio in collaboration with Heerim have won the competition to design the 32 tower masterplan for the Eunma Housing Development in Daechi-Dong, Seoul. The approach of the residents, which involves the complete redevelopment of their current homes into a new and future orientated eco design, is seen as a blueprint for resident-driven development projects. 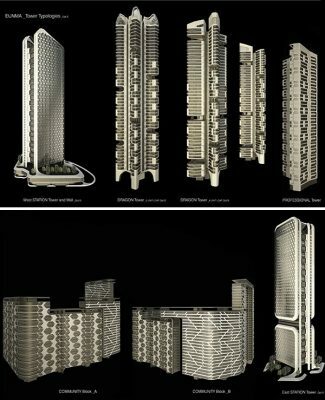 In UNStudio and Heerim’s design, the 32 tower masterplan becomes a unique and inspiring residential area. The entire transformation of over a million square meters includes the addition of more than 1,500 apartments to the 4,424 currently on the site. To enable this, the existing 35 story residential towers will be replaced with 50 story towers. This will enable the home owners to create state of the art apartments and amenity design and to locate all parking underground, facilitating a new eco landscape throughout the development. The Eunma Housing Development is situated in Daechi-Dong, the main residential area of Gangnam in Seoul, South Korea. Daechi-dong is referred to as the ‘Mecca of private education’, due to the high concentration of Hagwons (private schools) in the area. Within the Seoul area this is the district that sends the highest number of students to Korea’s ‘SKY’ universities. 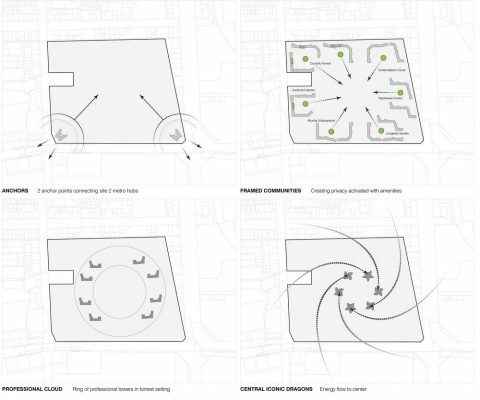 The Live, Work and Play philosophy begins with a study of choreographed movement on the site which takes place around six themed gardens that help to define each neighborhood block and inspire education: Curiosity Forest, Excitement Garden, Alluring Urban-ground, Contemplation Cloud, Playfulness Park and Longevity Fields. A multi-leveled ground floor forms the base of all addresses of this integrated development. The Eunma development follows an urban model that includes maximizing daylight and reducing direct views into neighboring apartments. 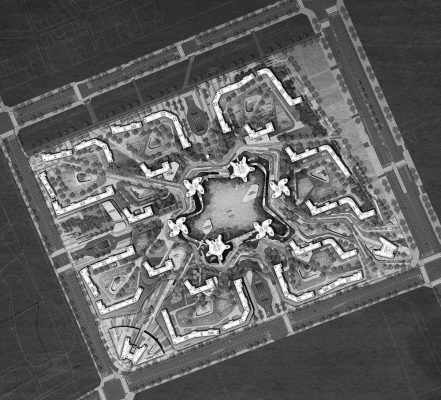 The model is divided into 4 circular themed zones and 6 landscape quadrants that pick up the characteristics of the site boundary. This organisation results in 24 bespoke neighbourhoods that provide a series of enriched experiences and visual attractions. Lively streets are located on two sides of the site boundary, with two main underground connections to nearby metro stations. The site is accessible for the surrounding neighborhood, with sightlines designed from the surrounding streets to the heart of the site. The programme complementing the urban connectors includes retail, food, beverage and leisure and as such strengthens the urban life of the development. Adjacent to this, educational centers and libraries are positioned around the family and community blocks, while sports and recreation facilities are clustered around the ‘professional towers’, designed to house young professionals. Six ‘iconic towers’ at the center of the site cater to luxury urban living, art, culture and healthy lifestyles. In addition to the site’s educational benefits, great emphasis is placed on creating a uniform south orientated and cross-ventilated tower typology, allowing all residents to enjoy full natural light, ventilation and a healthy living environment. To increase the feeling of safety on the site all car traffic and parking will take place under the landscape, the landscaping will be fully established from the start, entrances are spacious and welcoming and elevators service chiefly two apartments per floor. 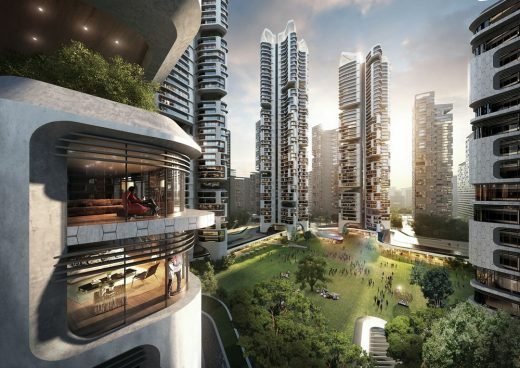 To strengthen the neighborhood feeling all apartment towers have elevated semi-public spaces which house community based programmes, such as sky-gardens and club areas. 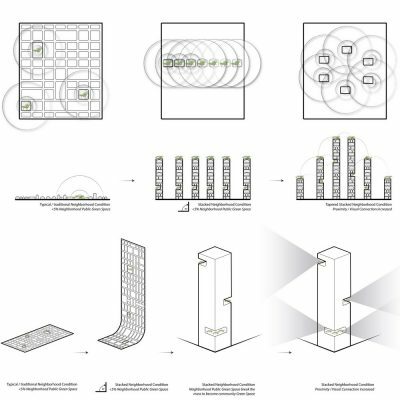 Programme: 32 towers, ranging from 25-50 stories (5,940 units) masterplan.